Let’s create an ad using the Persuasion Diagram from What I Know About Writing Ads I Learned In High School. This ad is for Elite Exterminating in Corpus Christi, Texas. Our objective is to promote their monthly in-home roach treatment. After interviewing the client, we are able to quickly determine most of the elements to fill in the Persuasion Diagram. Use this outline to create persuasive advertising in any medium. The Persuasive Proposition: roaches will keep coming back until you call Elite Exterminating. Point One: Once they establish a presence in your home they’re nearly impossible to remove. Point Two: You only see a few of the thousands of roaches in your home. Elite Exterminating will kill them all. Point Three: Elite Exterminating is committed to complete customer satisfaction. Call To Action: Pick up the phone and dial 853-8570. Attention-Getting Headline: Sometimes late at night you’ll hear their filthy little feet scuffling across the floor. OK. We have all of the major parts. Using the sequence shown in the diagram, let’s put the pieces together. Sometimes late at night you’ll hear their filthy little feet scuffling across the floor. Roaches will keep coming back until you call Elite Exterminating. Once they establish a presence in your home they’re nearly impossible to get rid of. You only see a few of the thousands of roaches in your home. Elite Exterminating will kill them all. Elite Exterminating is committed to complete customer satisfaction. Pick up the phone and dial 853-8570. This ad isn’t done, but even in this bare bones form you can read the sentences out loud and can quickly judge whether or not this strategy is valid. Our incomplete example already sounds as if it will get the attention of homeowners with roaches, and guide them to call. Let’s flesh out the skeleton a bit, and re-write some of the minor points to make our ad compelling. Sometimes late at night you’ll hear their filthy little feet scuffling across the floor linoleum. You move a soap bottle from under the sink, and you think you see something ducking down the drain opening. And you know that your home has been invaded. They’re roaches. You could try the powders, the sprays, and you’ll find that they roaches will just keep coming back until you finally call Elite Exterminating the full service pest control and termite company. They’re filthy, disgusting, and once they establish a presence in your home they’re nearly impossible to get rid of. You only see a few of the thousands of roaches in your home. Elite Exterminating will kill them all the roaches you see, and the thousands of roaches you’ll never see. Elite Exterminating, the full service pest control and termite company serving all of Texas and is committed to complete customer satisfaction. Roaches will keep coming back until you call Elite Exterminating. One call. No more roaches. Elite Exterminating: Pick up the phone and dial 853-8570. If we swap the second and third paragraphs the sequence will flow better. Here’s the final script. Produced with the appropriate sound effects, our radio ad is done. And yes, Mrs. Jacobson, I do remember that you told us not to end a sentence with a preposition. (A silly rule, up with which I shall not put). Please understand that my objective is persuasion, which tends to work more effectively when I write the way people speak. Next time, we’ll use the Persuasion Diagram to create a newspaper ad. Need help applying the persuasion diagram to the story you need to tell? Drop Chuck a note at ChuckMcKay@FishingforCustomers.com. Or call him at 760-813-5474. 20. I’m extremely impressed with your writing skills and also with the layout on your blog. Is this a paid theme or did you customize it yourself? Either way keep up the nice quality writing, it’s rare to see a great blog like this one these days..
Catch these before they are transferred to the archives. Fishing for Customers and Reeling them In. 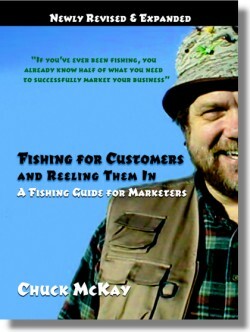 By applying common sense "fishing" rules, Chuck McKay claims that you already know half of what you need to successfully market your business - and you can easily learn the other half with the help of this book.